Officially known as Actun Tunichil Muknal Cave, but commonly referred to as the ATM Cave, this vast underground complex offers visitors a fascinating glimpse into the lost world of the ancient Maya. Abandoned more than 1,000 years ago, the ATM Cave was once used by ancient Maya priests to conduct some of their most solemn and grisly ceremonies. Inside the ATM Cave are thousands of artifacts, including obsidian weapons, ceramic offering pots, and other religious items, but the reason why people come from around the world to the ATM Cave is to see the remains of more than a dozen human sacrificial victims. Ranging in age from just a few months old to young adults, the bones of the people sacrificed to the Maya god of rain and war, Chac. Archeologists believe that the people were sacrificed between 800 and 900 AD, near the end of the Maya civilization when climate change and civil war were causing widespread chaos. The most famous human remains still visible in the ATM Cave are those belonging to the “Crystal Maiden.” Approximately 20 years old at the time of her death, her bones have slowly calcified with the minerals inside the cave to acquire a glittering sheen. To protect the relics, no photography is allowed inside the ATM Cave, and only licensed tour operators are allowed to bring visitors into the cave. To enter the cave, visitors must trek through the jungle in central Belize before arriving at a small, spring-fed pool. Visitors must then swim across the pool and then trek through a running creek in order to enter the first chamber. The ATM Cave is also known as the Cave of the Stone Sepulcher because the ancient Maya used natural stalagmites to carve a large religious altar. Further in, visitors will see other carvings, including those of faces and animals. To reach the chamber where the bones lie, visitors must climb up a ladder to a remote ledge. In order to protect the bones, visitors must remove their shoes, so bringing a change of clothing and an extra pair of socks is mandatory. 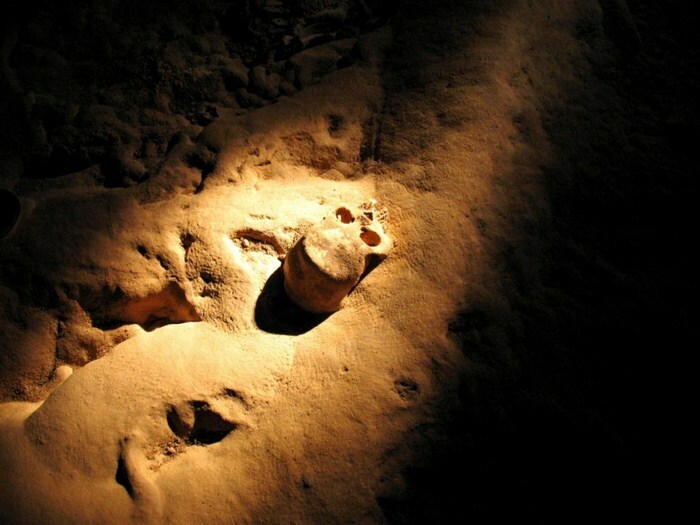 Locals in Belize refer to the ATM Cave as Xibalba, the ancient Maya term for the underworld. It is believed that the cave is a gateway to the underworld of the gods known as the Lords of Xibalba, with terrifying names like Stabbing Demon and Skull Staff. If you’re interested in exploring the ATM Cave while visiting Placencia, Hopkins, or Dangriga, contact Barefoot Rentals and Services.